Compatible for the following vehicles. VAUXHALL - ASTRA Mk IV (G) Saloon - 1.6 09.00 - 05.05 62 84 1598. VAUXHALL - ASTRA Mk IV (G) Saloon - 1.7 DTI 16V 02.00 - 05.05 55 75 1686. VAUXHALL - ASTRA Mk IV (G) Hatchback - 1.6 02.98 - 09.00 55 75 1598. VAUXHALL - ASTRA Mk IV (G) Hatchback - 1.6 09.00 - 05.05 62 84 1598. VAUXHALL - ASTRA Mk IV (G) Hatchback - 1.7 DTI 16V 02.00 - 05.05 55 75 1686. VAUXHALL - ASTRA Mk IV (G) Hatchback - 1.7 TD 02.98 - 08.00 50 68 1700. VAUXHALL - ASTRA Mk IV (G) Estate - 1.6 03.98 - 04.04 55 75 1598. VAUXHALL - ASTRA Mk IV (G) Estate - 1.6 03.98 - 04.04 62 84 1598. VAUXHALL - ASTRA Mk IV (G) Estate - 1.7 DTI 16V 02.00 - 05.05 55 75 1686. VAUXHALL - ASTRA Mk IV (G) Estate - 1.7 TD 02.98 - 08.00 50 68 1700. VAUXHALL - ASTRAVAN Mk IV (G) - 1.6 i 08.98 - 09.00 55 75 1598. VAUXHALL - ASTRAVAN Mk IV (G) - 1.6 i 09.00 - 08.06 62 84 1598. VAUXHALL - ASTRAVAN Mk IV (G) - 1.7 DTI 16V 04.01 - 08.06 55 75 1686. VAUXHALL - ASTRAVAN Mk IV (G) - 1.7 TD 08.98 - 08.06 50 68 1700. OPEL - ASTRA G Hatchback (F48_, F08_) - 1.2 16V 02.98 - 09.00 48 65 1199. OPEL - ASTRA G Hatchback (F48_, F08_) - 1.2 16V 09.00 - 01.05 55 75 1199. OPEL - ASTRA G Hatchback (F48_, F08_) - 1.6 02.98 - 09.00 55 75 1598. OPEL - ASTRA G Hatchback (F48_, F08_) - 1.6 09.00 - 01.05 62 84 1598. OPEL - ASTRA G Hatchback (F48_, F08_) - 1.7 DTI 16V 02.00 - 01.05 55 75 1686. OPEL - ASTRA G Hatchback (F48_, F08_) - 1.7 CDTI 04.03 - 01.05 59 80 1686. OPEL - ASTRA G Hatchback (F48_, F08_) - 1.7 TD 02.98 - 08.00 50 68 1700. OPEL - ASTRA G Saloon (F69_) - 1.2 16V 09.98 - 09.00 48 65 1199. OPEL - ASTRA G Saloon (F69_) - 1.2 16V 09.00 - 01.05 55 75 1199. OPEL - ASTRA G Saloon (F69_) - 1.6 09.98 - 09.00 55 75 1598. OPEL - ASTRA G Saloon (F69_) - 1.6 09.00 - 01.05 62 84 1598. OPEL - ASTRA G Saloon (F69_) - 1.7 DTI 16V 02.00 - 01.05 55 75 1686. OPEL - ASTRA G Saloon (F69_) - 1.7 CDTI 04.03 - 01.05 59 80 1686. OPEL - ASTRA G Saloon (F69_) - 1.7 TD 09.98 - 08.00 50 68 1700. OPEL - ASTRA G Estate (F35_) - 1.2 16V 02.98 - 09.00 48 65 1199. OPEL - ASTRA G Estate (F35_) - 1.2 16V 09.00 - 07.04 55 75 1199. OPEL - ASTRA G Estate (F35_) - 1.6 02.98 - 09.00 55 75 1598. OPEL - ASTRA G Estate (F35_) - 1.6 09.00 - 07.04 62 84 1598. OPEL - ASTRA G Estate (F35_) - 1.7 DTI 16V 02.00 - 07.04 55 75 1686. OPEL - ASTRA G Estate (F35_) - 1.7 CDTI 04.03 - 07.09 59 80 1686. OPEL - ASTRA G Estate (F35_) - 1.7 TD 02.98 - 08.00 50 68 1700. Visit our shop for more parts. 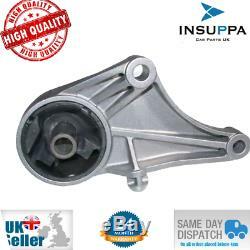 The item "VAUXHALL/OPEL ASTRA G MK4 1.6i 1.7 DTI 16V ENGINE MOUNT FRONT MANUAL 90576047" is in sale since Wednesday, January 30, 2019. This item is in the category "Vehicle Parts & Accessories\Car Parts\Engines & Engine Parts\Engine Mounts". The seller is "insuppa-trading" and is located in Christchurch. This item can be shipped worldwide.